Boys are more than twice as likely as girls to say they hate writing and find it embarrassing, according to a National Literacy Trust poll. Over a fifth (20.9%) of boys surveyed said they did not enjoy writing at all compared with 8.6% of girls. 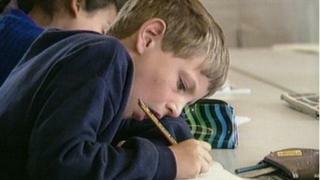 Some 35,000 pupils aged between eight and 16 took part in the UK-wide survey. Broadcaster and children's author Simon Mayo said the key to getting boys to pick up a pen "is to find a topic that interests them". Almost a third (30.2%) of the boys said they never or rarely wrote outside lessons, compared with 17.3% of girls. About a fifth of the boys admitted that they "would be embarrassed" if their friends saw them write. Only one in eight of the girls girls said the same. Nearly one in three of the boys said there was no point in learning spelling and grammar in the age of the spellchecker, compared with about a fifth of girls. Just under 15% of both sexes said they wrote some of their school work in mobile phone "txt-speak". The girls were also more likely to say "writing is cool", with over a third saying they enjoyed it so much they did it every day outside class. Only a quarter of the boys said writing was cool. Mayo said he himself had struggled with writing at school and still found it tough, despite having written three children's books. "It feels like chiselling rock with a spoon," he said. Mayo told BBC News he "agonises" about content, grammar and dialogue. "Each sentence takes me far too long," he said. Mayo said he had gone through school "without showing any aptitude" for writing but one day the teacher had read out the opening paragraphs of his essay "because I had actually got it right for once". He began writing his first children's book as a short story for his son and "was completely captivated by the plot". "The characters and the story took over," he said. He suggests that "if you can grab a child's imagination in the same way, getting them to write about a hobby or something they really enjoy doing, then the whole story writing world is open to them". In the survey, over three-quarters of the children and young people agreed that "writing is more fun when you can choose the subject" - but almost half said they had trouble deciding what to write. Julie Gibbings, of the National Literacy Trust, said: "It is through writing that children learn to formulate thoughts and improve their creativity and thinking skills. "Our research shows that we must focus on increasing boys enjoyment of writing if we are to support them to succeed at school and throughout their future lives."